Maybe you don’t like to be without teeth — ever. Or maybe you get a little forgetful sometimes. Whatever the reason, if you’re wearing your dentures to bed at night, we have one message for you: Please stop! 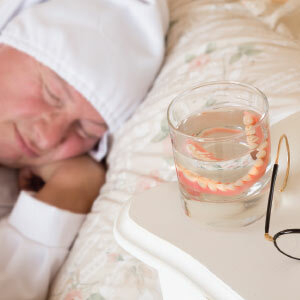 Sleeping in dentures can have serious health consequences. A recent study published in the Journal of Dental Research found that nursing home residents who wore their dentures to sleep were 2.3 times more likely to be hospitalized or even die of pneumonia as those who did not sleep in dentures. But how can wearing dentures at night more than double your chances of getting a lung infection? As the study noted, pneumonia-causing bacteria can readily be moved from the mouth to the lungs simply by breathing. And dentures that are not removed at night can become breeding grounds for all kind of bacteria and fungi (such as yeast). That’s what makes them potentially dangerous. Another condition often seen in people who wear upper dentures continually is called denture stomatitis, which is characterized by a red, inflamed palate (roof of the mouth) that has been infected with yeast. The yeast microorganisms can also infect cracked corners of the mouth, a condition known as angular cheilitis. Moreover, it has also been shown that people who sleep in dentures have higher blood levels of a protein called interleukin 6, which indicates that the body is fighting an infection. Need we go on? Remove and rinse your dentures after every meal. Brush your dentures at least once a day with a soft toothbrush or denture brush and dish soap, liquid antibacterial soap, or denture cleanser (but don’t use toothpaste — it is too abrasive). Store your dentures in water or a solution made for this purpose. Brush your gums and tongue every day with a soft toothbrush (not the same one you clean your dentures with). Rinse your dentures in clean water before you put them back in your mouth. If you would like any more information on dentures and oral hygiene, please contact us or schedule an appointment for a consultation. Modern restorations for severely damaged or missing teeth are truly remarkable. Although the type of restoration may differ — dental implant, bridge, or veneer — the end result is a life-like facsimile that matches the shape and color of your natural teeth. To achieve this result, though, the new crown or veneer requires fabrication in a dental laboratory, a meticulous process that may take a few weeks. In the interim, we often install temporary crowns. These help in a number of ways: because we’ve prepared the teeth for final restoration by removing some of the tooth structure, the temporary crown protects and stabilizes the teeth, reduces sensitivity and helps maintain gum health. Temporary crowns also enable the patient to present a more natural smile while waiting for the permanent restoration. Temporary crowns are typically manufactured to fit a wide range of patients, similar to an “off-the-rack” suit from a clothing store. In recent years, though, customized “tailored” temporary crowns designed specifically for an individual patient have grown in popularity among dental professionals as well as patients. In creating a customized temporary crown, we first perform a smile analysis similar to one used for a permanent restoration. After a careful assessment of your mouth, we would then make recommendations about the elements to include in the temporary crown, including shape and color. We would also factor in your desires and concerns into the final design. Working together with the dental laboratory, we would then have the temporary crowns produced and ready to apply as soon as we complete the preparatory work. Customized temporary crowns also serve another important purpose as a kind of “dress rehearsal” for the permanent restoration. This gives you an opportunity to “try out” the smile you’ll have with the permanent restoration in your daily life. We can then use your experience to make adjustments to the permanent crowns before final production. 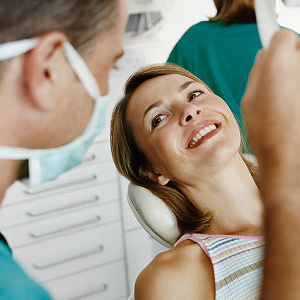 While customized temporary crowns involve more effort and expense than the traditional, the benefits are worth the added cost, especially if you’re involved with an extensive “smile makeover” procedure. Not only will you look better while your permanent restoration is under construction, your temporary look will give you added confidence that your future smile is right for you.